I write about lots of books that I read. Over the past year or so though, I haven't technically been reading them, but listening. I love to read, but I hadn't been reading as much as I would have liked to over the past couple of years, because I didn't have tons of time to sit down and focus on a book. Often when I would sit down to read, I would fall asleep. I was getting pretty frustrated because I felt like I was missing out on something that I love so much. I first heard about Audible from my former co-worker. She said that she was using it to listen to some longer length books during her hour long commute to and from work every day. At that time, she was listening to the Game of Thrones series. I thought that was an amazing idea. I signed up for my free trial of Audible, and downloaded The Goldfinch, which I had been hearing really good things about. I listened to it on a road trip to Rochester, instead of listening to the radio. I was hooked. I loved that I could listen to books and get the story and be multitasking at the same time. I started listening all the time. I would listen when I was driving, when I was cleaning, when I excercise, when I was at work and making copies. Anytime someone else is listening to music, I'm listening to books. A lot of people comment on my love of audio books. They say that they hate them, or that they could never do it. Sometimes they ask if I am getting as much benefit out of listening to an audio book as I would be if I had read the paper version. I think I am. And Forbes thinks I am too. I still read a lot of paper books, because I like to hold a paper book and read it. I like the feeling of it. I like to sit on my couch and read. But I can retain just as much when I listen as when I read. My imagination works just as well. I am about to finish A Feast for Crows: A Song of Ice and Fire #4 (the fourth Game of Thrones Book), and I have listened to all four of them on audio book. I've also listened to lots of other long books this year, like The Goldfinch, The Nightingale, and All the Light We Cannot See. They all were so good, and I probably wouldn't have finished them by now if I was reading them in paper book form. If you want to try an audio book, I suggest trying Audible. Your first book is free with your 30 day trial. 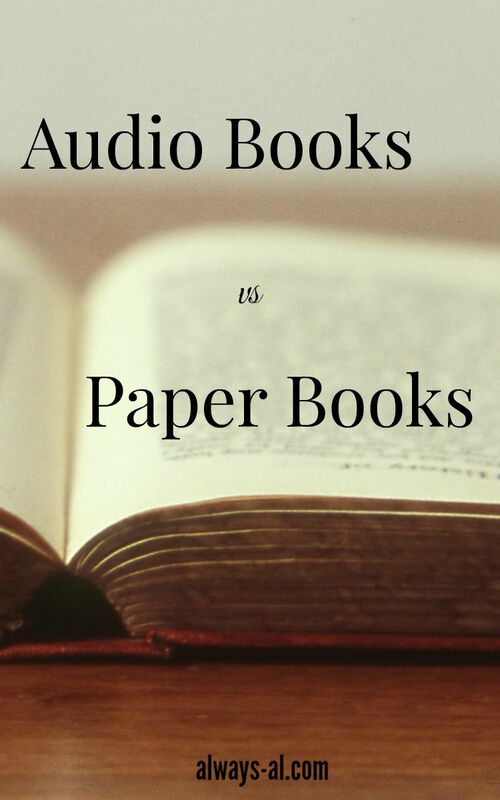 For now, I am going to keep with my combination of paper books and audio books. It works for me.